This recipe is from ‘Veganomicon’, and one I’ve made many times – always a big hit. It helps to have a good quality bundt pan, but I expect it would work equally well in a normal cake pan – or even spread over two, and then sandwiched together with your favourite filling. I serve it with nothing but a dusting of icing sugar, it is that good just on its own. 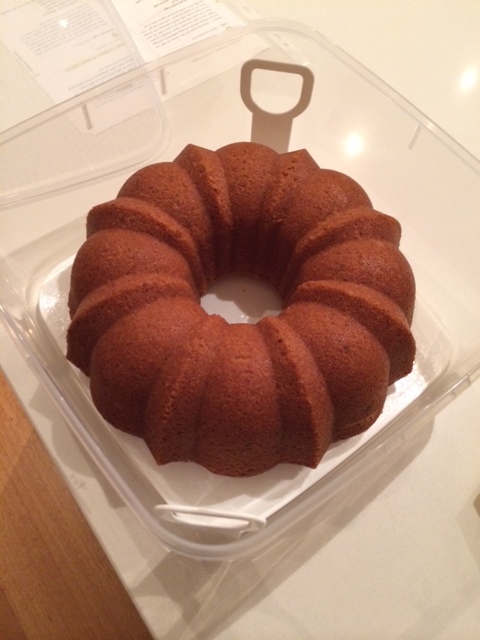 Preheat the over to 170 degrees C, and grease (or spray with oil) an 8-10″ bundt pan. In a large mixing owl combine the sugar, oil, coconut milk, rice/soy milk, lemon juice and zest, and vanilla. Stir well to combine. Sift the flour, baking powder, baking soda, and salt into the wet ingredients in batches, mixing well after each addition. Fold in the coconut. Pour the batter into the oiled bundt pan, and bake for 50-60 minutes until a knife inserted through the cake comes out clean. Remove from the oven and cool for 10 minutes, then place chopping board or plate over the cake pan and gently flip it over and release the cake from the pan. Once cool, sift over some icing sugar and serve. Sitting in my handy cake transporter!